I was not sure where to post this thread, BUT I plan to watch my first sporting event in VR tonight. I mentioned this in another thread. I got an NBA trial just so I can watch this game, BUT I think it has expired. NO worriers, I will get another trial, OR just pay the 6.99 to buy the game. THAT is how much I want to check this out! And I don't even like basketball. HOWEVER I have enjoyed the few games I went to where I had court seats, and THAT is what I expect this to be like. Just the fact that this is possible is what intrigues me. Anyone else going to virtually join me at the game? Ok interesting experience that did NOT go as planned. It appears NextVR is not quite ready for prime time on the Daydream platform. I was NOT able to watch the game. Just after game time I put on my headset and started up the app, BUT the game was mysteriously not listed. HMMM, so I figured maybe my free trial was over and I had to pay for the game, no worries it's only 6.99. So I bought the game, rebooted the phone and tried again. STILL no game!!!! Ok so I have a tweet out to NextVR to find out what is up. HOWEVER the NBA was superb in handling this and they gladly refunded my 6.99. 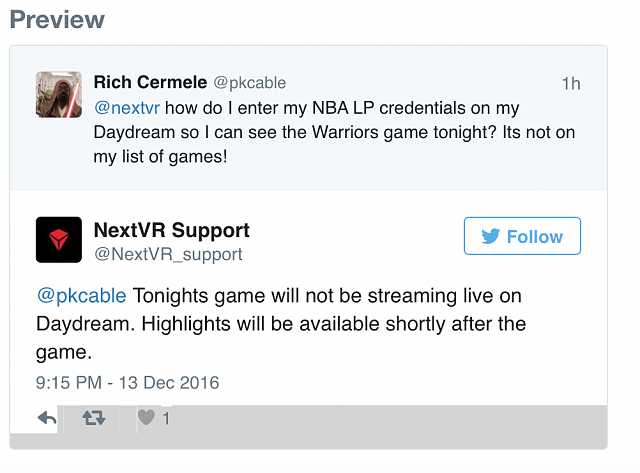 Kudos to the NBA, I will DEFINITELY buy more games if/when NextVR gets this sorted out! PS for sure I will watch the game highlights when they post them most likely tomorrow. Glad you got your a refund. Hope things will be better next time around. I'm not an NBA fan either really, I was just doing this because I REALLY appreciate the technology! Once NextVR gets this together they WILL get 6.99 from me! Hopefully they'll do Hockey games soon! So you should be right about how good it is, and if it's true, we will be able to watch any sport on VR pretty soon. The highlights, condensed and full game replays I have viewed are amazing!